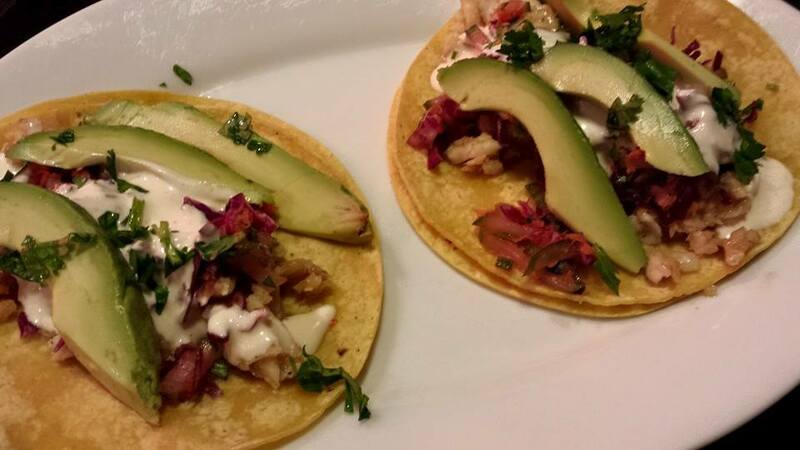 For part of my life, I could claim to be a “California Girl.” Having lived in California for about 8 years, I got to experience wonderful weather and fresh local produce all year round. One of my favorite foods that took advantage of all the fresh local California produce was Marcia’s Curried Mushroom Soup. Marcia Pelser is a neighbor who lived around the corner from our house when we lived in California in the late 1960s and early 1970s. She threw some great parties for my parents and the other adult neighbors. And Mrs. Pelser used to always include her kids and the neighborhood kids in her festivities. 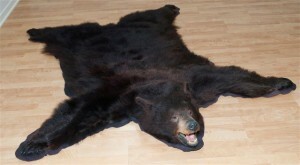 I was fascinated by this giant real bear skin rug complete with the bear’s head and big teeth that the Pelsers had on the floor of their family room. I was pretty convinced that bear would come to life at some point and attack me. It never did happen though. 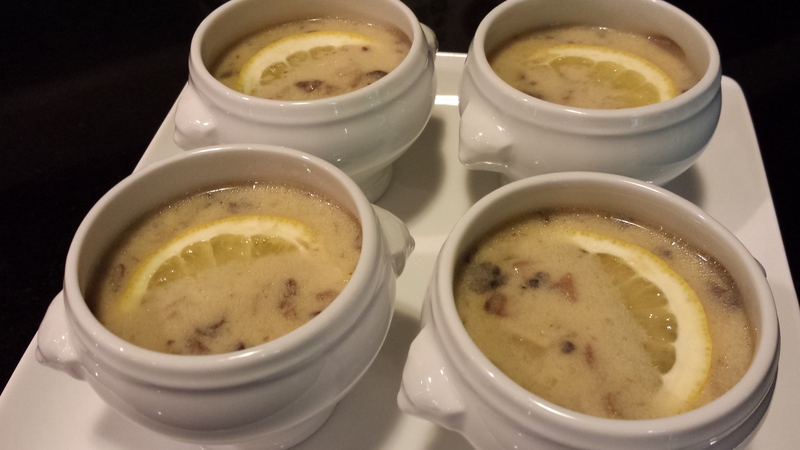 One of my favorite party goodies that Mrs. Pelser used to serve was her lovely curried mushroom soup. It’s rich and elegant and great for a dinner party. 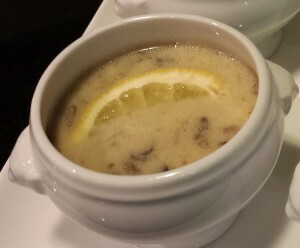 This soup is made with diced mushroom pieces so it’s sippable. Serve in a nice teacup, or in small shot glasses. 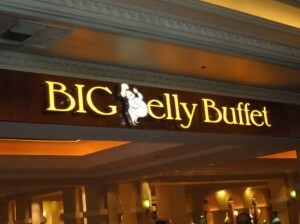 You could always puree it a bit if you prefer. 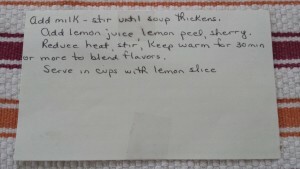 Most of my favorite recipes from the 1970s were written on index cards. I still have the card with Marcia’s transposed recipe that my Mom wrote up for me. In fact, this is a soup that might have been served by the stylish hostess Betty Draper at one of her Around The World dinner parties on the popular Mad Men television series. 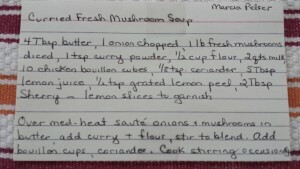 Now let’s talk about Marcia’s Curried Mushroom Soup recipe. 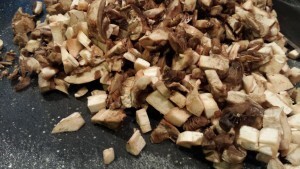 Start by dicing some mushrooms and onions. Saute the diced mushrooms and onions in butter. Add flour and curry powder. Cook a few minutes. Then add bouillon cubes, coriander powder and milk. 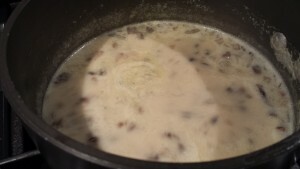 Cook and let soup thicken, stirring often. Add lemon juice, lemon peel, and a touch of sherry. Cook for a few minutes. Keep soup warm for 30 minutes so the flavors can enhance. Ladle the soup into sipping cups. 1. Over medium heat in an 8 qt. 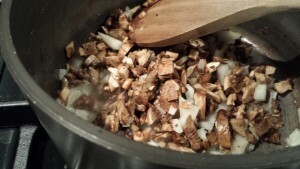 stock pot, saute onions and mushrooms in the butter until vegetables have softened. 2. 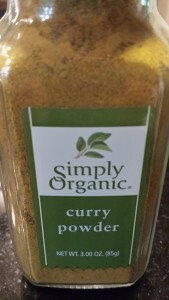 Add the curry and the flour and stir to blend. Cook 3 minutes. 3. Add bouillon cubes and coriander. 5. Add milk, stirring until soup thickens. 6. Add lemon juice, grated lemon peel, and sherry. 7. Reduce heat, stir, and simmer for 30 minutes or more to blend flavors. 8. 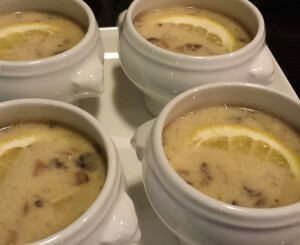 Serve in sipping cups garnished with lemon slices. 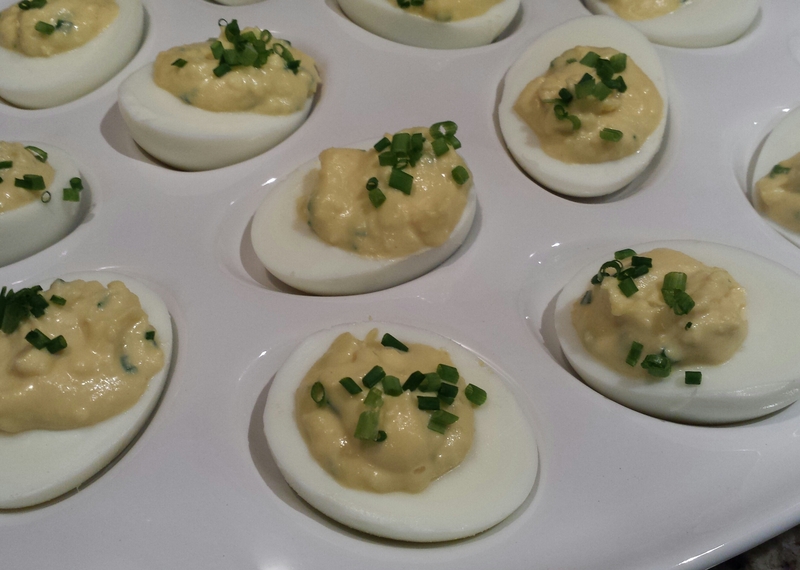 Serves 6 – 12 as a sipping appetizer depending on serving size. 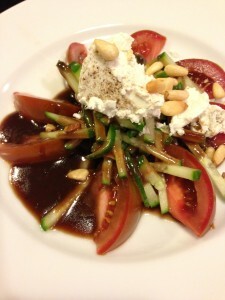 Can also serve as a soup course per diner which should serve 4 people. Variations: Use fat free milk instead of whole milk. 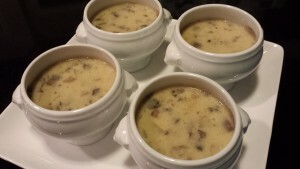 Substitute chicken stock for the chicken bouillon cubes and reduce the amount of milk. You can also use a thick chicken stock base in place of the bouillon cubes. If you can’t find ground coriander, use a spice grinder to grind some coriander seeds.